My Lords, energy and climate policy displays a great deal of groupthink and a reluctance to challenge long-held assumptions, even when the evidence changes. So it was refreshing to work on this report, which questions many of those assumptions. As has been pointed out, the report identified two main failings in current energy policy. First, we have moved rapidly from a framework which allowed market forces to shape the energy market to one where virtually every major investment decision is taken bureaucratically. In the process, we have lost almost completely the idea of a merit order in which different technologies can compete. Secondly, successive Governments have paid lip service to the trilemma of three objectives: security, affordability and carbon reduction. But in the Miliband/Huhne/Davey—and even Clark—era, one of those objectives consistently trumped the other two. Whenever there was a conflict, carbon reduction, in particular through the promotion of renewables, has prevailed. Other objectives, such as security and affordability, but also air quality and land use, have taken a back seat. The promotion of renewables has been accorded not one but two major privileges: not just subsidies of many billions of pounds but the first right of dispatch, so that, if at any time there is surplus supply of electricity, other fuel sources must yield. As a result, the economics of gas-fired capacity has been shot to pieces, and very little such capacity has been created, at a time when coal and nuclear output will be declining. While some premium can be justified for renewables on account of their low carbon intensity, inadequate account has been taken of the cost to the system of providing back-up capacity to cover intermittency. As a result, the margin of spare capacity has been severely eroded. I do not, however, believe that the lights will actually go out. The risk will manifest itself in a different way. In response to this situation, the Government have cobbled together a range of measures, including the capacity mechanism. The criticism is that they will prove costly; have unwanted consequences, such as the promotion of diesel generation; and will encourage old fossil-fuelled stations to remain on the grid rather than encourage investment in new, efficient gas-fired stations. The report recommended that the top priority should always be security of supply, with the best achievable balance between affordability and carbon reduction being sought subject to that. It is clear, however, that affordability too has taken a back seat. The report demonstrates that in the past decade, compared with the rest of Europe, energy costs in the UK, for both households and businesses, have gone from being relatively competitive to relatively expensive. The environmental add-ons have played a significant part in this and are projected to increase. The precise figures, however, are unclear, with what are really environmental taxes being ​disguised by being routed through the accounts of the energy companies, thereby evading parliamentary accountability. “a lot of our really poor policy decisions have been driven by the fact that we set very hard timetables in law—that we have to hit certain targets by 2020, 2030 and, subsequently, 2050”. Nowhere has this unnecessary haste been more damaging than in the nuclear sector. It has been glaringly obvious that EDF has been struggling to build a reactor to a new and much more complex design, anywhere near the original cost and time estimates. In the light of the latest announcement from EDF on cost and time overruns, the response we received from the Secretary of State was utterly complacent. It is a mistake, as other noble Lords have pointed out, to take comfort in the fact that cost overruns fall to the constructor. If costs were to rise too far, the project could be abandoned, with the risk being handed back. Therefore, it is essential that a comprehensive plan B is acted on. As the recent NAO report revealed, the emphasis on getting an early deal on Hinkley Point ruled out several options—for example, waiting until construction risk was reduced, establishing a competition with other bidders or the exploration of other financing models. In my view, at the heart of all this is a flaw in the design of policy-making. One objective—rapid decarbonisation—is well entrenched and has a whole apparatus of support and defence. It is the only objective to have statutory backing and the only objective with a dedicated watchdog, the Committee on Climate Change, which is guaranteed access to Parliament. Indeed, there has always been cross-membership between this House and the committee. The committee is not just a consultative body; it has the right of first proposal. I also discovered that the four strategic objectives listed in the committee’s annual report make no mention of security of supply or affordability. By comparison, the objectives of security of supply and affordability have no equivalent protections or advocacy. Therefore, it is not surprising that decision-making has been unbalanced. Instead of optimising between three conflicting objectives, we have seen the maximum pursuit of one of them at the expense of the other two. There is one other mantra in the Committee on Climate Change theology—sadly, repeated by the Secretary of State in his response to the EAC—and that is the claim that, as a result of the Government’s policies, energy costs will be reduced. This is achieved only by claiming that increased energy efficiency will offset the various environmental levies. However, that ​is a fallacy because the pursuit of energy efficiency could be undertaken independently from decisions on energy costs. “after we have left the European Union, we will form our energy policy based not on the way energy is generated but on the ends we desire—reliable and affordable energy, seizing the industrial opportunity that new technology presents and meeting our global commitments on climate change”. That appears to acknowledge the trilemma and an end to the automatic primacy of the renewables objective. The other ray of hope is the promise of an independent review into the cost of energy. Better still is the appointment of Professor Dieter Helm as the review’s chairman. He has been a severe and clear-sighted critic of current energy policy. This review is important and it should be wide ranging. Since the gestation of the Climate Change Act a decade ago, much has changed, although the thinking behind it has not. Global temperatures have risen but on a track well below the range of most climate change models. Incidentally, can anyone tell me where I can find the scientific basis for regarding an extra 1.5 degrees centigrade as a tipping point, or is it just a nice line in a communiqué? Many of the predictions about the harmful effects of climate change have been exaggerated. “I think we’ll all look back in history and think the period of three years at $100 per barrel or above was an aberration”. There are other reasons for looking again. No other country has followed us down such an extreme unilateralist and legislated path. Severe damage has been done to our energy-intensive industries, and money has been transferred from the pockets of poor families to those lucky enough to be able to install solar panels or wind turbines. For two of the technologies which were thought essential to achieve the CO2 target at reasonable cost, one—nuclear power—is struggling and, in the case of carbon capture and storage, research has been abandoned. Therefore, there is a lot to revisit, but if the EAC’s report and this debate contribute to this rethink of policy, they may well have proved worth while. My Lords, as one of the few non-members of the committee speaking in the debate, I gladly pay tribute to its report, although it is not for our comfort. I think it makes it clear that the supply of electricity has become a very complex ​matter. For me, the central question is whether this complexity provides a richer range of policy options in relation to our electricity supply or whether it points to a rising level of confusion and risk. Why is a bishop—I say to the noble Lord, Lord Turnbull, that bishops are always curates at heart—interested in this area? I have a scientific background and have always been drawn to issues where science and public policy interact. Thirty years ago, I was concerned that the then “dash for gas”, as it was called, in electricity generation on the back of new supplies from the North Sea was a poor and profligate use of a flexible fuel and chemical feedstock that would be available for only a limited duration. All sorts of estimates were being made about when “peak oil” would be reached and about the ever-escalating price of oil and gas. But how wrong I was, and indeed how wrong most—I might almost suggest all—forecasts were. The world is now awash with cheap oil and gas for the foreseeable future. The unimaginable has come to pass. 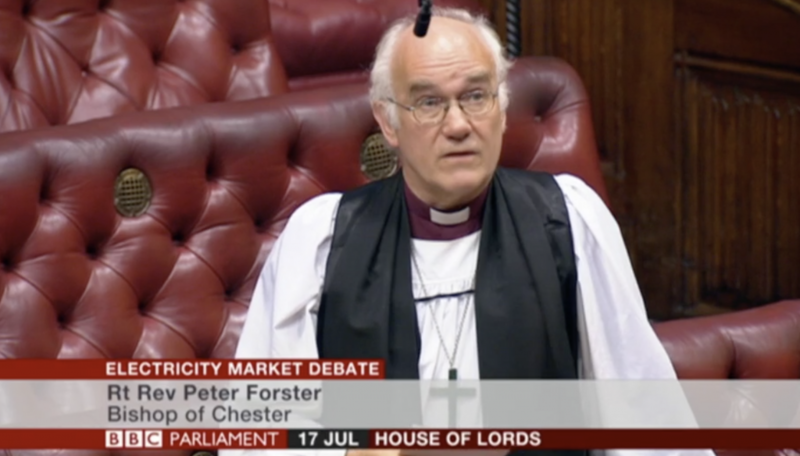 Subsequently, and especially in my years as a bishop, I have become concerned about the rising cost of electricity and its differential impact upon those who, by a socioeconomic judgment, are among the poorest in our society. Levels of fuel poverty have been stubbornly high, underpinned by rises in the cost of electricity. The report describes how the cost of electricity in the UK has risen over the past decade, from being among the cheapest in Europe to much higher comparative levels for everybody. The figures given in the report are stark. In the first half of 2016, for the most energy-intensive industries in Britain, electricity costs were no less than 86% higher than the median in the EU. This has stimulated various government measures to compensate the energy-intensive industries and stem their movement abroad. These are set out in paragraph 102. Will the Minister please tell us what the overall costs are of these schemes and confirm that these costs are met from general taxation and not by distribution to other consumers? “Adding further information to consumer bills would run counter to Ofgem’s ambition to simplify bills”. But is there not a confusion between the proper desire to simplify the range of tariffs that are available and the need for transparency around the costs that are being incurred by consumers? Scottish Power has supplied me with electricity for a number of years, and the transparency has decreased. I compared my four-page bill from 2010 with a bill received in 2017. In 2010, I was told that 62% of my bill comprised wholesale costs, which is rather more than is the case today: 18% transmission, 9% administration and profit, and 11% VAT and government obligations, including 6% green levies. My latest bill runs to six pages and includes various advice and information about saving energy. It tells me, for example, that it will cost me 1p to run my laptop for two hours. But it contains no information ​whatever on the breakdown of the bill and what proportions are attributable to the different components, including green taxes, which are rising year by year. Does the Minister seriously defend this lack of transparency? The cost of the new contracts for difference will add to the green levies, and here Hinkley Point takes star billing. I will not repeat all that has been said but the headline figure from the NAO is £30 billion—from one power plant, in a time of austerity and cuts in public expenditure. Think what £30 billion could do. It is a huge amount of money. If we are to have further nuclear plants, will we have the same strike price of £92 a megawatt? We need some assurances, because £30 billion—even spread over the lifetime of the heir and successor to the noble Lord, Lord Forsyth—is a huge amount of money. These costs, and others that come with current climate change policies, are recouped through the electricity bills of consumers. That is weighted towards domestic consumers because of the subsidies for big industrial consumers. This is a very regressive form of taxation and attributing the costs; that point has not been made clearly enough. At the very least, all this surely demands the maximum transparency rather than the obfuscation that the report reveals. 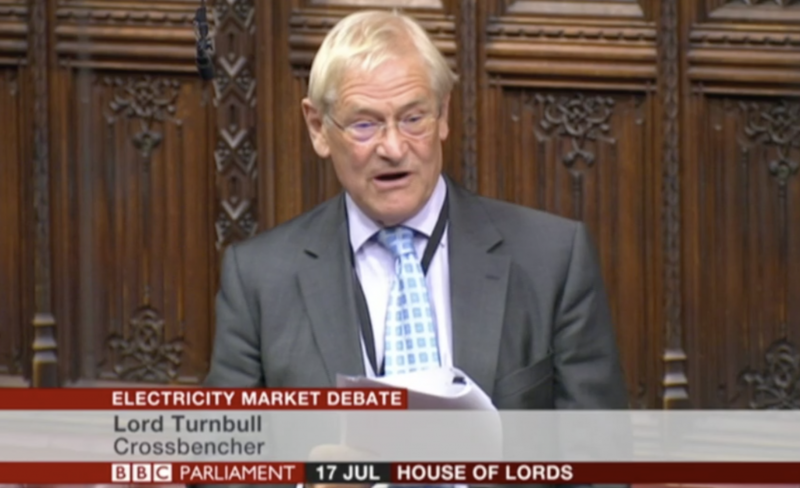 I would like to make some comments about the capacity market, which the Government have stated is at the heart of their plans to maintain security of supply, at least in the immediate future. What assumptions are being made about the interconnector capacity, to which the noble Lord, Lord Darling, and others have referred? By 2022, the interconnector capacity will have almost tripled, from the present 4 gigawatts to almost 11 gigawatts. Is supply delivered through the interconnectors to be permitted to enter the capacity market? If so, the important question is: what legal and contractual guarantee of supply will exist? I underline the words “legal” and “contractual. My understanding is that, at the moment, the supply comes and goes according to who is willing to pay most—it is purely economics. If that 11 gigawatts is to be brought into play for security of supply, what security is really there? We need some answers. If Hinkley Point falls further behind schedule—which seems an odds-on certainty, although we hope not—the capacity market auctions will be very important. That is true not least if an additional pressure on the capacity margin arises due to the switch to electric cars, as the national grid warned only last week in the Financial Times, which I happened to pick up. Finally, I will refer briefly to what I call the two elephants in the report. The simpler one, to which the noble Lord, Lord Turnbull, alluded in passing, is carbon capture and storage. It seems to have all but disappeared from current planning, but not long ago it was all the rage in these debates. All around the House people were saying this was the future and now it is not mentioned at all. I am not surprised because I was a chemist in a previous incarnation. The chemistry is not difficult but the cost of doing it on a big scale will be huge. It is a cost issue. With CCS it is not a technical problem but a cost problem. Adding those ​costs now, on top of everything else, has surely made it a political no-chancer. However, it would be good for the Minister to state a suitable epitaph for CCS, or otherwise bring us up to date about what its place is in government planning. The second pachyderm in the room—again the noble Lord, Lord Turnbull, identified it—is the large and diffused one of current climate polices and the Climate Change Act. It was outside the scope of the report—I understand why—but its influence runs through the report and we should acknowledge that. “The Government has prioritised insulation over fire safety”. It will be interesting to see how the judicial inquiry looks at that. One could also refer to the complete reversal of government policy on diesel cars as the serious impact on public health became apparent. All that was driven by the same decarbonisation agenda. These matters are obviously beyond the current report but the common factor is the practical impact of current climate policies. Perhaps time will justify these policies. I cannot rule that out as a possibility, although my judgment is to doubt this. What is certain is that the price to be paid for current policies, in all sorts of ways, is very high and typically falls disproportionately on the poorest and most vulnerable in our society. Will it all have been worth it? My only hope is that I will live long enough to find out.